The Zooey dress is a right-on-trend skater style with a hemline hitting just knee-length and long sleeves. Made of a soft, heavier weight ponte fabric. Great for the office or dinner with your guy. Features a loose round neck with panel details on the bodice and a zipper in the back. Pleats on the skirt give extra flare. This dress works after pregnancy too! The Audrey is the ultimate maternity LBD (Little Black Dress)with truly versatile style. Gorgeous golden zip details add sparkle to the hip area. Weighted stretch jersey is super soft & structured, making the the ideal dress to wear to work and take right into a dinner date. Sculpts & contours your fabulous pregnant curves, Zips up the back. This dress was spotted on Gwen Stefani, so it is sure to be a quick sell out! 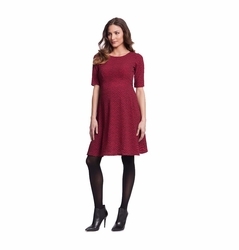 We have the perfect career maternity dresses no matter what your profession! Quality and style combine with comfort and functionality to make up the best selection of maternity career dresses. Designers include Olian, Maternal America, Japanese Weekend, Maternite, Everly Grey, Seraphine, Lilac and more! Also check out our selection of maternity Jackets and Sweaters, Skirts and Pants to complete your career maternity wardrobe.